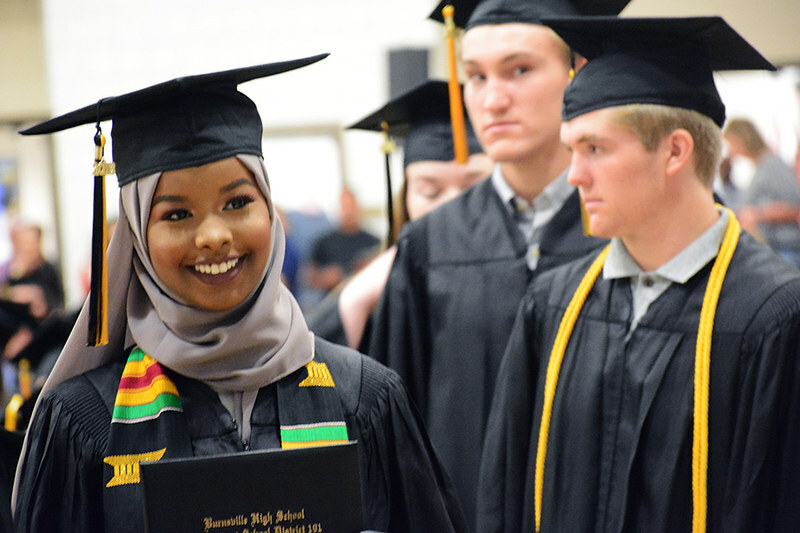 The 577 students in the 62nd annual Burnsville High School Class of 2018 received diplomas in a commencement ceremony on June 8. Student speakers at commencement were Fiona Chow, William Alvey and Olivia Brammer. Musical performers were Katie Lyon, Jasmine Buckner and Daniel Akah. The Concert Choir performed under the direction of student Jon Butler. There were 15 Valedictorians this year – a higher number than in several years. Valedictorians, who have earned a perfect 4.0 Grade Point Average (GPA) at Burnsville High School, are Courtney Funk, Alexander Gude, Justin Jasperse, Gregory Johnson, Makaela Kallstrom, Albert Liu, Katie Lyon, Elizabeth McCormick, Anna Nguyen, Bailey Pekar, Emily Reynolds, Thomas Ryan, Joshua Stebbins, Anna Warmka and Robert Wedan. The salutatorian (with a GPA of 3.992) is Samuel Andrews. The graduation ceremony can also be viewed online at http://www.burnsville.org/index.aspx?NID=1770.